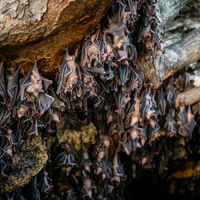 ANDRZEJ KRAUZEBats carry and transmit some of the world’s deadliest zoonotic viruses: Ebola, Marburg, Nipah, and the pathogen behind severe acute respiratory syndrome, SARS coronavirus, to name a few. What has puzzled researchers for a long time is why bats don’t appear to get sick from their unusually high microbial loads. The question has been nagging Peng Zhou, a virologist at China’s Wuhan Institute of Virology, for more than a decade, ever since he took part in a survey of bat populations in southern China. Zhou and his colleagues were looking for the strain of the SARS coronavirus responsible for the 2003 outbreak that sickened more than 8,000 people worldwide and killed nearly 800. “We started to think, why bats?” he says. Other researchers have suggested that bats’ super-tolerance might have something to do with their ability to generate large repertoires of naïve antibodies, or that flight ramps up the animals’ body temperatures to a fever-like state that helps fight off infections. But in 2013, Zhou and his colleagues stumbled across another clue during a comparative genomics study of two distantly related bat species. The genes that showed some of the strongest evidence of positive selection, the team found, appeared to be related to DNA damage and innate immunity (Science, 339:456-60). “We thought we needed to go further and work on the molecular mechanics,” says Zhengli Shi, Zhou’s colleague at the Wuhan Institute and a coauthor on the study. 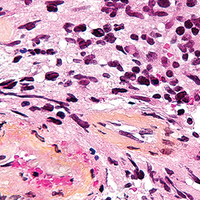 The team decided to focus on a protein known to lie at the center of several molecular pathways involved in the vertebrate innate immune response. STING, or STimulator of INterferon Genes, detects pieces of DNA where they shouldn’t be: in the cellular cytoplasm. 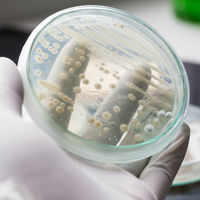 This free DNA can occur through infection by DNA viruses, and potentially also RNA viruses. Once activated, STING triggers rapid production of signaling proteins called interferons that help launch an immune response against infection. Sequencing of the gene encoding STING in a handful of mammal species revealed a striking abnormality in the bat version: a mutation—responsible for a single replacement of a serine residue with another amino acid at an important phosphorylation site in the STING protein—was universal across 30 bat species. By contrast, the serine was retained in 10 other vertebrate species, including zebra-fish, chickens, and nonflying mammals such as the house mouse and cow. In a series of subsequent in vitro experiments, the researchers found that bat STING—isolated from the Chinese rufous horseshoe bat, Rhinolophus sinicus—produced a significantly milder interferon response compared to its mouse counterpart when treated with a known activator molecule in vitro. The team could encourage the production of higher levels of interferons if they corrected the mutation to restore the serine residue. Conversely, they observed a decrease in interferon production by human STING after they pulled the serine out (Cell, 23:297-301.e4, 2018). The findings suggest that this mutation dampens bats’ interferon-activating pathway just enough to stop the animals’ immune systems from going into overdrive. Many viruses are so deadly to humans and other animals because they trigger an uncontrollable storm of interferons and other inflammation-inducing molecules, overwhelming the immune system, Zhou explains. 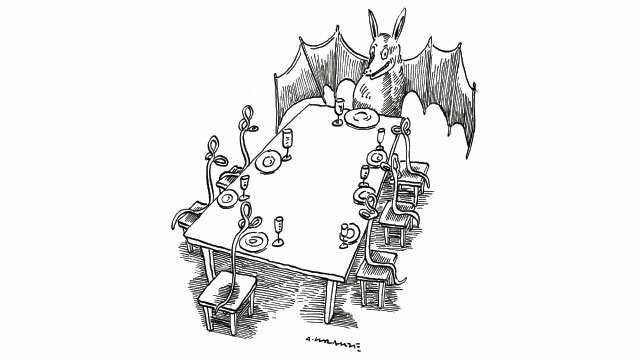 But, by virtue of this mutation, bats can avoid such chaos, and instead can tolerate the same viruses. “That has a very significant meaning for bats,” he says. Despite STING’s role in viral responses, Zhou believes that the mutation may be conserved in bats for a different reason, one related to another aspect of bats’ livelihood. Fragments of the bats’ own DNA can also be released into their cells’ cytoplasm as a byproduct of the strenuous effort bats make during flight, Zhou says. This has led him to the hypothesis that the mutation originally provided an evolutionary advantage to bats by preventing their immune systems from boiling over every time the animals fly. Emma Teeling, a bat biologist at University College Dublin who was not involved in the work, says she isn’t surprised by the findings. Her own research has shown that bat macrophages will quickly mount a robust antiviral response when immunologically challenged, but compared to those of a mouse, they will then rapidly backpedal on their response by releasing anti-inflammatory cytokines (Acta Chiropt, 19:219-28, 2017). “What bats are very good at doing is resolving their constant inflammation,” she says. She adds that this may have given bats an edge not only over viruses, but perhaps also over death itself. “As you age, your level of inflammation increases,” she says. “This should be even more heightened in bats because they have such a high metabolic rate.” Evolving ways to dampen inflammation might have had a knock-on positive effect for longevity, and could partly explain why bats live disproportionately long lives compared to nonflying mammals of similar body size. For now, “how flight is incorporated into this field is still just a hypothesis,” cautions Vincent Munster, chief of the virus ecology unit at the National Institutes of Health. Zhou’s study is a good step toward understanding what makes bats’ immune systems so special, Munster adds, “but I think the biggest challenge now is how to put this in the bigger perspective.” Researchers still don’t understand how bats’ immune systems overall are responding in vivo to these viruses, he says, adding that STING is just one part of the story.